Among the treasures on display at the Coney Island History Project's exhibit center this season is Coney Island's oldest surviving artifact from the dawn of the "World's Playground." The 1823 Toll House sign dates back to the days when the toll for a horse and rider to "the Island" was 5 cents! The earliest settlers of Coney Island knew better than to build at the ocean's edge. In the early days, development began along Coney Island Creek, where violent winter storms were less likely to wash away structures. Coney Island remained isolated until March 1823, when the Coney Island Road and Bridge Company constructed a bridge and toll house on Coney Island Creek at what is now Shell Road. The Coney Island Causeway toll road opened for business in early 1824 and horse-drawn carriages were soon speeding south to the beach. James Cropsey and Daniel Morell operated the toll house until 1839. John Lefferts took over as toll-taker until 1876, when Andrew Culver bought the property for his Prospect Park and Coney Island Railroad, the predecessor of today's Culver Line. Coney's first hotel, the Coney Island House, opened on a sand dune a short distance away on the current site of McDonalds's restaurant on Neptune Avenue. This small triangle of land witnessed the beginning of Coney Island as a resort. The Toll House stood at the corner of Shell Road and Coney Island Creek for over a century before the City demolished it in 1929 during a street-widening project. 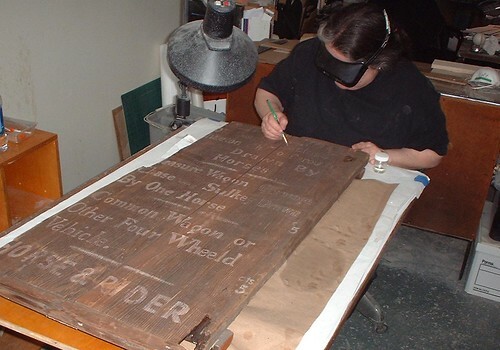 The sign was rescued by Coney Island ride inventor and amusement manufacturer William F. Mangels, who put it on display in his American Museum of Public Recreation on West 8th Street and Neptune Avenue. Mangels collection was sold in 1955 and the sign was purchased and restored by the Coney Island History Project in 2007. Today, the 192-year-old sign, often described as Coney Island's "first admission ticket," is on view for the first time since 2010 at the History Project's exhibit center. It complements this season's special exhibit "Coney Island Stereoviews: Seeing Double at the Seashore, 1860-1920." Stereoview photography of Coney Island began in the 1860s, providing the earliest documentation of the resort. This exhibit features original stereoview photo cards, antique stereo viewers, and enlargements of some of the oldest photographic images of Coney Island including Coney Island Creek itself. The History Project's exhibition center season is from Memorial Day Weekend through Labor Day on Saturdays, Sundays and holidays. Located at 3059 West 12th Street at the entrance to Deno's Wonder Wheel Park, the Coney Island History Project is just a few steps off the Boardwalk. Visitors are invited to take free souvenir photos with "Skully," a veteran of the Spookhouse and Spook-A-Rama, and an original Steeplechase horse from the legendary ride that gave Steeplechase Park its name. New hours are 1:00PM till 7:00PM. Admission is free of charge. For additional photos or information email events@coneyislandhistory.org or phone the History Project at 347-702-8553.